Gardening for the mind. 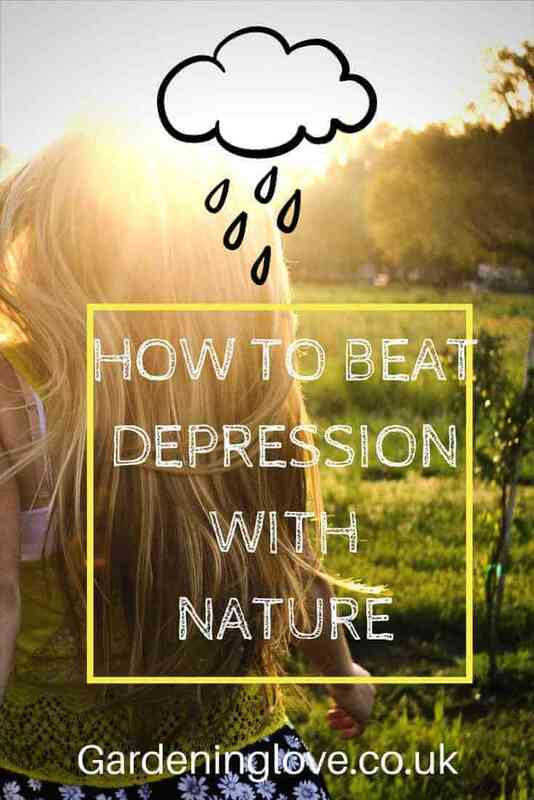 How to fight depression with nature. Depression has been a part of my life for some years now. It can manifest itself in a number of ways. For those of you who have ever suffered with depression or know of someone who has this illness then you will know how debilitating it can be. As for myself I can only describe it as a heavy dark cloud that hovers over me, following me around as I try to get on with my day. I have good days where I can push the cloud away and see beautiful blue sky above me, I feel positive and find silver linings in the little things. I try to hold onto those days because they can be few and far between. Some days I wake up and my glass is half empty before I lift the duvet. The glass can be running dry by mid morning if it’s a really bad day, and I can still have another 10 hours or so to go before the end of my day. The reason I have chosen to write this post is because unfortunately depression and mental health is still quite a taboo subject. It took me a long time to speak to my doctor, family and friends about how I was feeling. I was worried what they would think of me. For anyone reading this post who finds themselves feeling like they can relate to this i urge you to speak to some one, anyone that you feel you can open up to in confidence. I have been very fortune in that my loved ones have been incredibly supportive. Things feel that little bit easier with it being out in the open. What has this got to do with gardening ????? I hear you say…………..
Well actually …….everything, for me anyway. After speaking out and seeking professional help I actually felt quite lost for a time, not knowing how to heal myself. Its not like putting a plaster on a wound knowing that in time the wound will heal. Where did I go from here ? How can I fix myself??? I started taking small steps, one day at a time looking for things that I found happiness in by taking it all back to basics and listening to my heart. My best mental state was when outdoors, breathing in fresh air surrounded by nature. I would go for walks but made sure I was out of the hustle and bustle of everyday life. Heading towards trees, fields, flowers and birdsong. I’d try and still my mind and focus only on what I could hear around me. The wind, leaves rustling, birds singing etc. Taking time to appreciate all I could see…… the grass, the flowers the sky etc. I realised that I craved this environment more and more as a way of escapism. It helped me to be more positive because I was able to take time to notice all these things that actually made me happy and peaceful. I was able to find a way of using this to control my negative mindset. The outdoors became my church. I needed to try and keep this feeling close to me so that I could reach for it when I needed to. I sat in my back garden one day and closed my eyes. It was a bad day for me, the black cloud hung heavy in my sky. As i sat there I noticed the birds singing and it immediately distracted me. It was something to focus my attention on that I associated with calmness. I opened my eyes and saw my green grass and as I breathed in a calmness washed over me. I knew then that I had everything I needed right there, a place I could escape to, where I could create my own church with mother nature as my guide. This is where gardening comes into play. I still have bad days, good days and ok days but I cannot recommend highly enough how much the outdoors have helped me. There are many obvious benefits that gardening can offer such as exercise, fresh air and good old vitamin D. However there are so many other positive things that this past time can offer the mind. For some people it can give a sense of purpose. Maintaining the garden and caring for your own piece of nature. Helping you to actually get outdoors, knowing that your plants need watering and therefore having a reason to be more active. Filling your bird feeders because the birds are relying on you. The sense of achievement that gardening can give you is immense. When you have planted a seed, watered it, cared for it and that little green shoot pops out of the soil !! wow ….. you did that ! Rushing from A to B and back again. We all need a thing that helps us to unwind…. slow down and switch off. For me if only one person reads this post and they take something positive from it then it will have served its purpose. Whether you too have depression or any other mental health related illness. Or if you just need a way of chilling out, get outside, give it a go. It doesn’t matter whether you have gardened before or if you only have the outdoor space for one plant pot. It’s about trying. Just plant a seed and watch it grow.